"THE CHEROKEES are nearly all prisoners. They have been dragged from their houses and encamped at the forts and military posts all over the nation.” Thus Baptist missionary Evan Jones described the beginning of the forced removal of the Cherokees in June 1837. By the early 1800s, the Cherokees of northern Georgia had a highly developed culture. Their legal system was patterned after that of the United States, and they printed their own books and newspapers. White missionaries—Moravians, Presbyterians, Congregationalists, and Baptists—mingled among them to share the gospel and inculcate Christian values. Then gold was discovered in the north Georgia mountains, and white settlers looked longingly at the Cherokees’ land. The eventual outcome: the government’s decision to move the Cherokees beyond the Mississippi. By March 1838 the last group had arrived in Oklahoma, their new home, but at least one-third had died along the way. This is one of the saddest chapters in American history. It helps explain why white attempts to evangelize American Indians in the West met with so much resistance, and why missionaries had relatively little to show for their efforts. This attitude was shared by the U. S. government, which in the early nineteenth century worked hand-in-hand with churches to “civilize” the natives. In 1819 Congress passed a bill establishing a Civilization Fund, making $10,000 available annually for instructing Indians in agriculture, literacy, and other such pursuits. Much of the money was given to church agencies that worked with Native Americans. The dilemma of churches, and of the country, was whether to assimilate the Indians into the prevailing culture or simply remove them to other areas when they got in the way of the country’s westward movement. The latter course of action eventually prevailed—often with missionary approval. Isaac McCoy, for example, a Baptist missionary to Native Americans in Kansas, favored not only removal but complete separation from whites for the security of Native Americans against white abuse. Though most missionaries could not see beyond their cultural assumptions, some made efforts to move at least part way toward the people to whom they ministered. One example is Cyrus Byington, who, along with some colleagues, organized the Presbyterian Mission to the Choctaw Indians in 1818. Like Eliot and Mayhew before him, Byington laid great emphasis not only on preaching the gospel but on teaching Native Americans to adapt to white culture and learn the English language. But Byington also devoted himself to mastering the Choctaw language, and in time, wrote several books in Choctaw. Eventually, Byington began to preach in Choctaw, and many were converted. Tunnapinchuffa, an adult male, was the first Choctaw to respond to the gospel message in his own language. Tunnapinchuffa became concerned about his spiritual condition in late 1827 and spent much time in fervent prayer. He described himself and his people in deprecating words and urged his family and friends to throw away their “black and dirty garments.” He also worked earnestly at transforming his own “bad thoughts” and overcoming the temptation of strong drink. By March 1829 he was accepted as a member of the Presbyterian mission church. One missionary wrote that Tunnapinchuffa “adorns his profession being a man of prayer; very industrious, meek and humble.” Tunnapinchuffa managed to retain some of his Choctaw identity (he never learned to speak English, for example) while maintaining a Christian commitment until his death in 1834. In 1833 the United States government ordered the removal of the Choctaws to southeastern Oklahoma; by 1835, Byington arrived there to take up his responsibilities with them again. He organized a church at Eagletown and preached there regularly. Soon, five other churches sprang up. The missionary continued to study Choctaw, writing books and even translating the Bible into the language. During Byington’s lifetime, at least 2,700 Choctaws “accepted Divine Grace,” and by 1860 more than 10 percent of the Choctaw tribe had united with a Presbyterian congregation. An additional 10 percent became members of other churches. Unfortunately, Byington’s successes were the exception rather than the rule for Protestant missionaries. 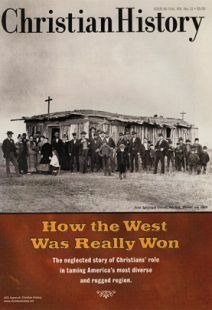 In 1925, after three centuries of missions, the Native American Christian community stood at a meager 35,000. Mistreatment by the U. S. government and lack of understanding by white missionaries were simply too much to overcome. In the twentieth century, however, missionaries of all denominations proved more culturally sensitive, with the result that the Protestant community grew to an estimated 120,000 by 1979. Bonnie Harvey earned her Ph.D in English at Georgia State University. She has written a number of nineteenth-century biographies including Fanny Crosby (Bethany), Charles Finney (Barbour), and Jane Addams (Enslow). Why the twentieth-century West—urban and explosive—ain’t what it used to be. How the West Was Really Won: Did You Know? What a famous painting reveals about America’s move west.